Posted on October 9, 2017 at 13:31. 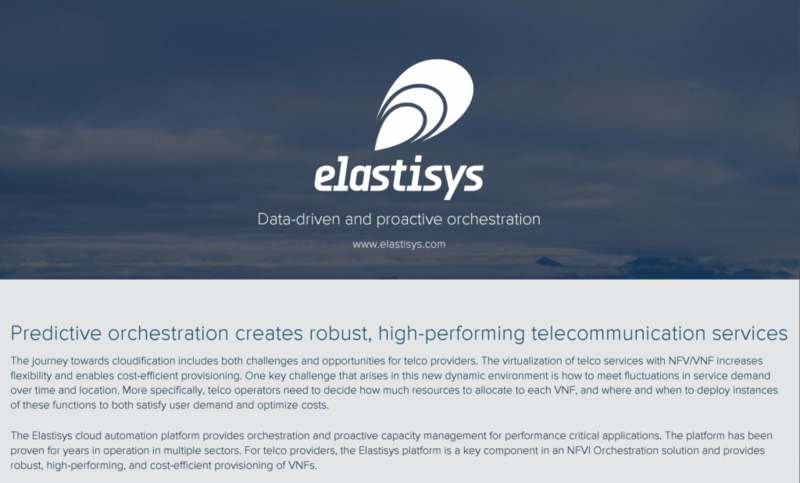 Elastisys releases a new one-pager titled Predictive orchestration creates robust, high-performing telecommunication services. In this short paper, we touch upon how the high demands in a carrier grade telco environment makes it necessary to work proactively with service management in a network function virtualization (NFV) scenario. Predictive analytics and automation can be used as a way to increase performance and availability of business critical virtual network functions (VNF:s) and we show how Elastisys solution is positioned to help service providers achieve that. Posted on October 2, 2017 at 08:26. Elastisys is going to SDN VNF World Congress, the world’s meeting place for Network Transformation, NFV+SDN & Automation for 5G, Transport & Cloud in The Hague between 9-13 October. Software-defined networking (SDN) and Network Function Virtualization (NFV) in telecommunications is all about virtualizing carrier networks and mission critical functions both in core networks and on customer premises. Elastisys research background in distributed systems and long experience of buildings system for managing business critical cloud workloads makes us well positioned to help communication service providers transition to this new paradigm of virtualized and software-defined infrastructure. Our software provides the next generation of proactive and automatic management of virtualized network functions for improved availability and performance of services in telecom operator’s networks. If you are going and would like to meet up, contact us! Posted on September 27, 2017 at 12:29. 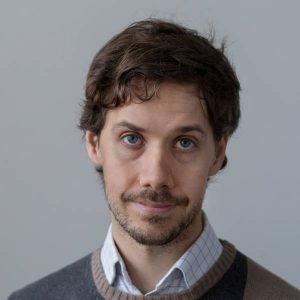 Elastisys CTO and co-founder Johan Tordsson will be speaking at OpenStack Nordic about how to achieve self-driving data centers with OpenStack. Today, computers master speech recognition, can provide help desk functionality, and even operate self-driving cars. Machine learning and AI have greatly improved automation across many industries, but ironically, use of such techniques are not widespread in IT operations. At Elastisys, we believe that large scale IT infrastructure should operate autonomously. The self-driving data center should collect and analyze operational data, and based on the derived knowledge steer operation to ensure performance and robustness. With self-driving IT infrastructures, operation teams can focus on high-level business goals and have the systems figure out lower-level operational tunings themselves. Tedious and potentially dangerous tasks based on reacting to lower-level monitoring can be replaced by strategic decisions. These concept is sometimes referred to as self-* systems that configure, heal, optimize, and protect themselves. We argue that the time for this to happen is right now. The great improvements in AI technologies and toolkits combined with the automation brought by the DevOps movement makes now the perfect time to build self-managing IT infrastructures. If you want to discuss this topic more in-depth and listen to some examples and lessons learned from our work, come join us at OpenStack Nordic. We would love to see you there and discuss the future of IT infrastructure automation. Posted on September 22, 2017 at 06:48. Johan Hellström, CEO of the newly combined AllTele and T3, steps in as new chairman of the board for Elastisys. Johan brings both leadership and business acumen to Elastisys. Johan started out in the military before switching over to the ICT industry and has carried leading roles at companies such as Martinsson, Atea and Tele2. For the last 6 years Johan have been CEO of T3, the northern ISP success story, growing the business by 500% before being acquired by AllTele earlier this year. “I see a clear need in the market for smarter solutions that address the high requirements of the IT infrastructure and applications of the future, both in telecom and IT. AllTele strives to bring the best technical solutions to our customers and Elastisys is interesting both from AllTele’s perspective as well as for me personally as I hope to help develop Elastisys with my business experience”, says Johan Hellström. Johan joins a already strong board including Northern Light Capital’s Jan Snygg and Partnerinvest Norr’s Lena Fridlund Forsgren. Jan Snygg has worked for Ericsson in Silicon Valley, has extensive experience as an investor and has been chairman in multiple successful companies like Umeå based Limes Audio which was acquired by Google 2017. Lena also has experience from working in the valley as well as an long investment background dating back to Swedish Innovationsbron in 2006 with multiple successful exits in her portfolio.